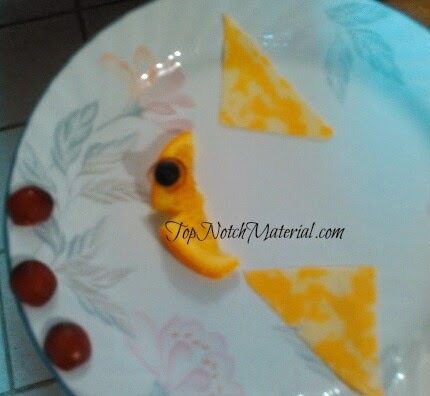 Mya was looking through a book recently Superfoods For Babies and Children and came across a really cute idea for a snack for toddlers or pretty much anyone who likes fruit and cheese (who doesn't?) She wanted to make this for us so of course I let her. She changed a little bit since we didn't have 100% of the ingredients that the book had. This is perfect for an everyday snack or even a play date/party. Since this recipe uses knives, please parental supervision if your child is making it. When we made this we made 10 fish at once. 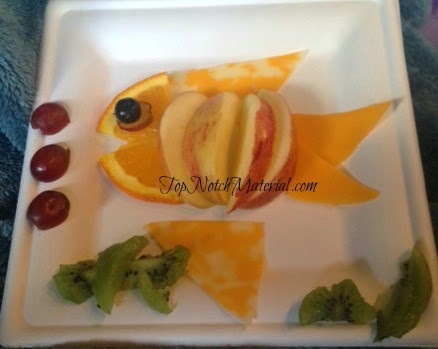 To make things easier we cut each fruit separate and placed on a plate then assembled all of them instead of making one fish at a time. 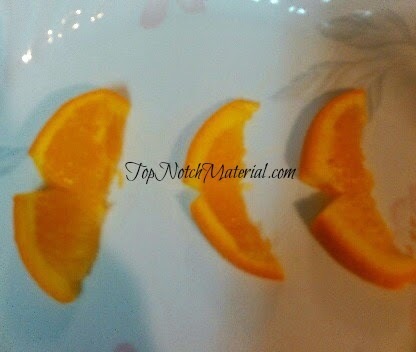 1. we cut up the orange into slices and then cut a tiny triangle for the mouth. 2. We cut the cheese slices for the fins and tail. the fins are cut at a triangle and the tail you can either cut 2 small triangles or just cut part of the big one. 3. We cut up the kiwi into 2 circles and some spears. This makes the seaweed appearance. 4. 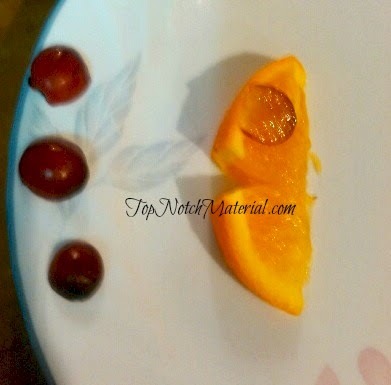 We cut 2 grapes in half for the “bubbles” and then cut the ends off the 3rd to make the main part of the eye. 5. We then cut the apple into small sections to make the body. You can use an apple slicer to make it easier and faster. 1. Place the orange head on the plate. 2. place the grape halves by the mouth for bubbles. 3. 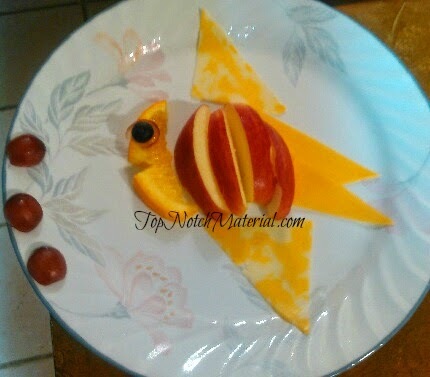 Place the cheese slices to show the fins and tail. and then the sliced grape for the eye, then placing the blueberry on top of the grape slice. 4. Place the cut up apples peel side up to arrange the body. 5. Arrange the kiwi at the bottom for the seaweed. You may copy recipes on to your own computer for personal use; however, you cannot copy this recipe in its' entirety and place on your blog without giving complete credit to Top Notch Material. You may share recipes in email or websites or IN PART, as long as credit is given to Top Notch Material as the author and provide a clickable text link DIRECTLY to the recipe on our blog. You may not sell or charge for access for any recipes copied from this blog. If sharing on Pinterest or other social media, please do not replicate entire recipe in description; please provide direct link to this post. Muy creativo, rico y facil de hacer. Un buen diseño para los niños!